History begins with a man named Walt. The history of Disneyland is monumental, dating back to the early 1940s when a man -- and his mouse -- had a vision. 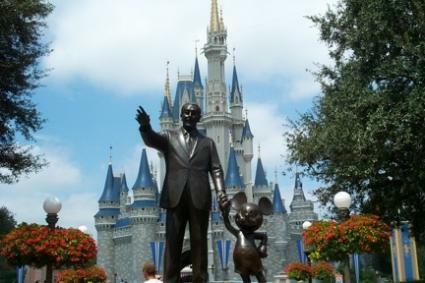 In more than a half-century, this dream has turned into one of the world's most popular theme parks. Today, Disneyland (not including California Adventure) boasts more than 14.7 million visitors annually. Taking a look at Disneyland's origins will give you a good idea of why it is so popular. Walt Disney was known in the entertainment industry as the "Father of Animation." He was a film producer, director, animator, entrepreneur, voice actor and screenwriter. He was man behind such classic animations as Mickey Mouse, Snow White and Donald Duck, to name a few. But while his cartoons and feature films were a success, he wanted to do more. Walt Disney wanted to bring Mickey Mouse to children in a fun and festive atmosphere. While on a business trip to Chicago, Illinois, in the late 1940s, he sketched out his plans for a children's amusement park, where Disney employees can bring their kids, as well as a place for the general public. His goal, he was quoted as saying, was for Disneyland to "look like nothing else in the world." Walt Disney originally planned to house Disneyland across from his studios in Burbank, California. However, after five years of planning and researching, he opted to bring his them park to Anaheim, California. On July 17, 1955, Walt Disney's dream came true as the gates of Disneyland opened for the very first time. The following is an excerpt of Walt Disney's speech, which is also inscribed in a plaque at the park's entrance: "To all who come to this happy place - welcome. Disneyland is your land. Here age relives fond memories of the past and here youth may savor the challenge and promise of the future. Disneyland is dedicated to the ideals, dreams and the hard facts that have created America . . . with the hope that it will be a source of joy and inspiration to all the world." The easiest way to see how Disneyland came to life as a theme park is through a timeline of events. This condensed version does not include dates when most rides and attractions opened or closed. March 1952: Walt Disney announced plans to build an amusement park in California. August 1953: After looking at several sites in Southern California, including Burbank, Disney chose Anaheim as the future home for Disneyland. July 1954: Officials broke ground on the 180-acre theme park. A one-year deadline was given to complete the enormous project. July 1955: Disneyland met its deadline and on July 17, opened its gates to 28,154 attendees. ABC television broadcast the event to 90 million viewers. A day later, it opened its doors to the public. Admission was $1 and rides ranged from 10 cents to 35 cents. October 1955: Park visitors were able to buy ticket books for rides and attractions. December 1957: First Disneyland Christmas parade debuted. Also on December 31, the park saw its 10-millionth visitor. June 1961: Theme park held its first Grad Night. Also this month, President Dwight D. Eisenhower and his wife, Mamie, visited the park. May 1966: It's a Small World opened. December 1966: Walt Disney died from cancer at the age of 65. 'July 1967: A newly redesigned Tomorrowland opened with a focus on technology and the future. August 1970: Members of the Youth International Party, known as Yippies, invaded the park, forcing it to close early. June 1971: Disneyland welcomed its 100-millionth guest. May 1977: Space Mountain opened in Tomorrowland, 10 years after initial plans were unveiled. June 1980: Splash Mountain opened in Critter Country. June 1982: Park ticket books were replaced by unlimited ride passports. February 1985: Disneyland opens year-round. Up until now, the park was closed on Monday and Tuesday. August 1985: The 250-millionth guest visited the park. May 1992: Fantasmic! light show debuted. November 1994: Skyway to Tomorrowland and Fantasyland closed. July 1996: Initial plans are announced for California Adventure, Disneyland's sister park. November 1999: FASTPASS was introduced on four rides. February 2001: California Adventure opened. May 2005: The park started its year-long 50th anniversary celebration. October 2006: Disney began phasing out unhealthy food in the park and cut back on using licensed characters to promote the snacks high in sugar and fat. May 2009: Disneyland honored its five-millionth Grad Night guest. George Lucas (Star Wars) was at the park on opening day. He was 11 years old. On the day Disneyland opened, the asphalt was not dry and the heels of ladies' shoes got stuck. The park's first ticket was sold to Walt Disney's brother, Roy, for $1. The city of Anaheim had trouble issuing permits for the park's submarines. There wasn't a code written permitting businesses to house submarines within city limits. Because of a city water strike, park visitors did not have enough water to drink on opening day. Food and other beverages were also in short supply.